These sweet Cashew Raisin Chickpea Balls are inspired by an Indian sweet called Besan Ladoo. I had a fantastic meal at one of my favourite Indian restaurant in Amsterdam yesterday. I am always amazed by Indian desserts and sweets. They are so different from what I grew up eating for dessert. I am not a big fan of traditional Dutch desserts and I don’t really have a sweet tooth but for some Indian deserts like kulfi, carrot halva or gulab jamun you can almost wake me up. I cannot get enough of the combination of spices like cardamon, saffron, star anise with nuts like pistachios, almonds or cashews. My Indian dinner last night inspired me to try on something completely new. I would never think of using chickpea flour (besan or gram flour) for a sweet dish but I must admit I really love the taste of sweetened and toasted chickpea flour. 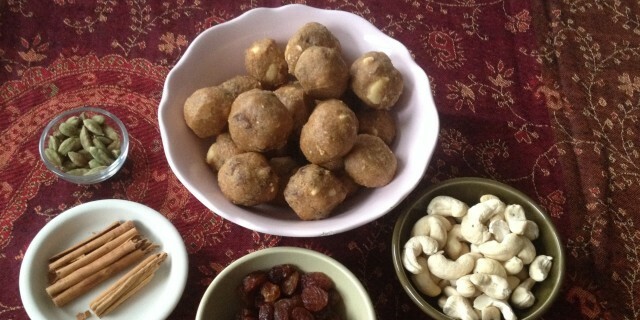 These Cashew Raisin Chickpea Balls are quite sweet, which is typical for Indian desserts. Besan ladoos (chickpea flour balls) are typically made with refined sugar but I have used coconut palm sugar instead. I love coconut palm sugar. It tastes rather like brown sugar with a hint of caramel and it’s works really in recipes with nuts. It’s also a healthier alternative to white refined sugar. These Cashew Raisin Chickpea Flour balls remind me a little bit of halva, the nutty and crumbly Middle-Eastern dessert usually made from tahini (sesame paste) or nut butter. The chickpea flour used for these balls gets a similar nutty flavour and crunchy texture once toasted. The cashew nuts are toasted along with the chickpea flour which gives the cashews an intense, caramel-like flavour. The raisins add a nice chewy and gooey bite to the dry and crumbly texture of the toasted chickpea flour. This recipe makes about 20 small balls. It is important to toast the chickpea flour for quite some time, stirring every so often. It is done when it has has a nutty and slightly sweet taste. If the flour isn’t toasted enough, it has an unappealing, dull and sour taste. The flour should be crumbly, nutty and browned when done. To make the balls, add a bit of flour to the palm of your hand and press it firmly into a little ball. The mixture should be quite dry and crumbly, not too oily. But if the balls crumble apart, you can always add a little bit of melted ghee or oil to make them more sticky. I have used ghee (clarified butter) in this recipe but you can also use coconut oil if you’re vegan or dairy-intolerant. I personally love ghee. Ghee has a lovely sweet, rich and caramel-like flavour, which adds a richness to the chickpea flour balls. Fully clarified butter (Indian ghee) should be almost 100% lactose- and casein-free. For those of you sensitive to casein or lactose, you might be able to digest ghee quite well. If you have a serious intolerance though, I recommend using coconut oil instead. Read more about dairy intolerance and ghee here and here. Everyone is different, I have no problems with ghee at all but listen to your own body! Heat ghee or coconut oil in a large non-stick saucepan. Once the ghee or coconut oil is melted, add the besan flour, crushed cashews and raisins. Toast the mixture on medium heat, stirring often. The mixture is done when brown and nutty. This will take around 20 minutes. Add coconut sugar, ground cardamom, cinnamon and salt and roast for a few more minutes. Place the mixture in a bowl and allow it to cool down completely before forming the balls. Then use your hands to form the flour mixture into small balls. If the balls don’t hold their shape, add just a little melted coconut oil or ghee. Place the balls in a single layer in an air tight container and store them in the refrigerator. They will keep for a week.